The Indian selection committee headed by MSK Prasad on Monday announced a 15-member Indian squad for the upcoming World Cup 2019. The panel has now further added that four seamers - Navdeep Saina, Deepak Chahar, Avesh Khan and Khaleel Ahmed - will accompany the squad as net bowlers. 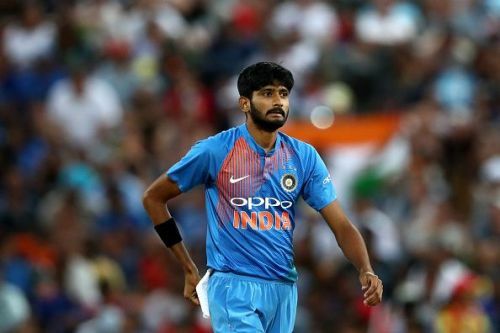 In the core team, India have included only three mainstream fast-bowlers - Jasprit Bumrah, Mohammed Shami and Bhuvneshwar Kumar. The likes of Saini and Khaleel won't be available for selection, but will be extremely valuable during practice sessions. As the World Cup is a long tournament, it will be quite challenging for the Men in Blue to keep themselves fighting fit throughout. A lot of the players are currently taking part in the Indian Premier League, which would also drain them of energy. In that context, the role of this quartet of players could be very important in ensuring that the fast bowling attack remains fresh.